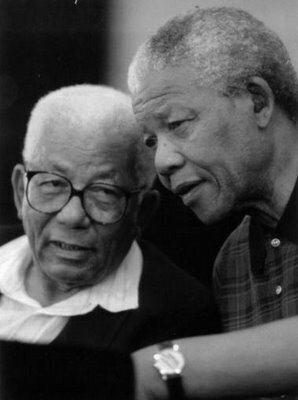 Walter Ulyate Max Sisulu, a key leader in the African National Congress (ANC), and confidant and mentor to Nelson Mandela, was born on May 18, 1912 in the village of Qutubeni in the municipality of Engcobo, to Alice Mase Sisulu, a Xhosa domestic worker. His father, Victor Dickinson, a white civil servant, was never a presence in his life. Instead, his upbringing was left to his mother and her family. Though he completed grade six, Sisulu was forced to leave the Anglican Missionary School at age 14 to support his family. While working in South Africa’s gold mines he met Clements Kadalie, the founder of the Industrial and Commercial Workers’ Union (ICU, formed in 1919), who solidified Sisulu’s belief in equality through unionism. In 1933, he returned to Soweto and became involved in numerous civic clubs including the Orlando Brotherly Society, a Xhosa cultural and aid group. In 1940, Sisulu formally joined the ANC and one year later he met Nelson Mandela whom he would persuade to join as well. Mandela and Sisulu formed a lifelong bond. Mandela served as best man at Sisulu’s 1944 wedding to Albertina Thethiwe, a young woman who would become a major political activist in her own right and with whom he would have five natural children, and several more adopted. When Apartheid was formally instituted by the South African government in 1948, Sisulu helped establish the ANC’s Programme of Action the following year and was elected Secretary General, a position he held until 1954. While Secretary General he planned work stoppages, strikes, and other protests against Apartheid. He also led the effort to build strategic alliances with other anti-Apartheid groups including the South African Communist Party (SACP), the South African Indian Congress (SAIC) and the Cape Franchise Action Committee (FRAC). Sisulu led the Defiance Campaign in 1952 where passive resisters marched through the streets in protest and were arrested and imprisoned. He and Mandela were arrested during one of these protests, convicted under the Suppression of Communism Act, and sentenced to nine months hard labor. Sisulu, working in secret, organized the committee that devised the 1956 Freedom Charter. In December of that year he was among 155 individuals arrested and tried for high treason. He was acquitted in 1961 but by that point he and three others had formed Umkhonto We Sizwe, “Spear of the Nation,” the armed wing of the ANC, the formation of which was prompted by the Sharpeville Massacre of 1960. In June 1964 Sisulu was convicted of sabotage and sentenced to life imprisonment at Robben Island. In 1982, Sisulu, Mandela, and other key ANC leaders were moved to Pollsmoor Prison in Cape Town to facilitate negotiations between the ANC and South African government. Both sides sought an end to the violence that had run rampant since Sharpeville. In October of 1989, Walter Sisulu was released after 26 years in prison. Mandela was released the following February and Sisulu was elected deputy President of the ANC while final preparations were made for a free democratic election. In 1994, the nation overwhelmingly elected Nelson Mandela as President of South Africa and Sisulu became a key adviser. Sisulu was involved in government until 1999. After his retirement he and his wife supported youth causes through the Omhle Trust, the Twa Twa Trust and others. Walter Ulyate Max Sisulu died on May 5, 2003, a few days before his 91st birthday. Both the Walter Sisulu Botanic Garden and Walter Sisulu University are named in his honor. Shelagh Gastrow, Who’s Who in South African Politics, no. 4, (Johannesburg: Ravan, 1992); Peter Joyce, A Concise Dictionary of South African Biography, (Cape Town: Francolin, 1999); Emmanuel Kwaku Akyeampong and Henry Louis Gates, Jr., eds., Dictionary of African Biography, vol. 1-6, (Boston: Oxford University Press, 2011); I Will Go Singing: Walter Sisulu Speaks of His Life and the Struggle for Freedom in South Africa/ In Conversation with George M. Houser and Herbert Shore, (Cape Town: Robben Island Museum, 2000); David Beresford, Walter Sisulu, Obituary, http://www.theguardian.com/news/2003/may/07/guardianobituaries.southafrica; Walter Sisulu, Biography, ANC Online, http://www.anc.org.za/showpeople.php?p=4.